In this paper, an efficient scheme of remotely preparing four-qubit quantum states via two-qubit maximally entangled states is proposed. This scheme can be accomplished by using appropriate unitary transformations and some classical communication. 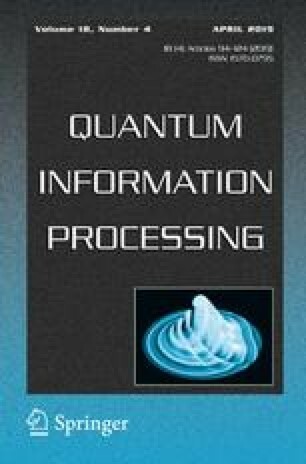 The detailed processes for preparation of four-qubit states are presented in the general case and two special cases, respectively. The method of constructing special measurement basis in general case is provided, and the similar methods for real-parameter state case and equatorial state case are also discussed. Meanwhile, the probabilities of successful preparation under each case are calculated in our schemes. The results show that the successful probability is only 1 / 16 in the general case, and the probability can reach up to 100% when the relative phase factors are zero or the amplitude parameters are 1 / 4. The authors thank Y. Zhu for helpful discussions. This work is supported by the Program for National Natural Science Foundation of China (Grant Nos. 61671475, 61271250, 61803382) and Natural Science Basic Research Plan in Shaanxi Province of China (No. 2018JQ6020) and China Postdoctoral Science Foundation Funded Project (Project No.2018M643869). The parameter matrix \(M_4\) used for constructing projective measurement basis in preparing arbitrary four-qubit state is shown as below. 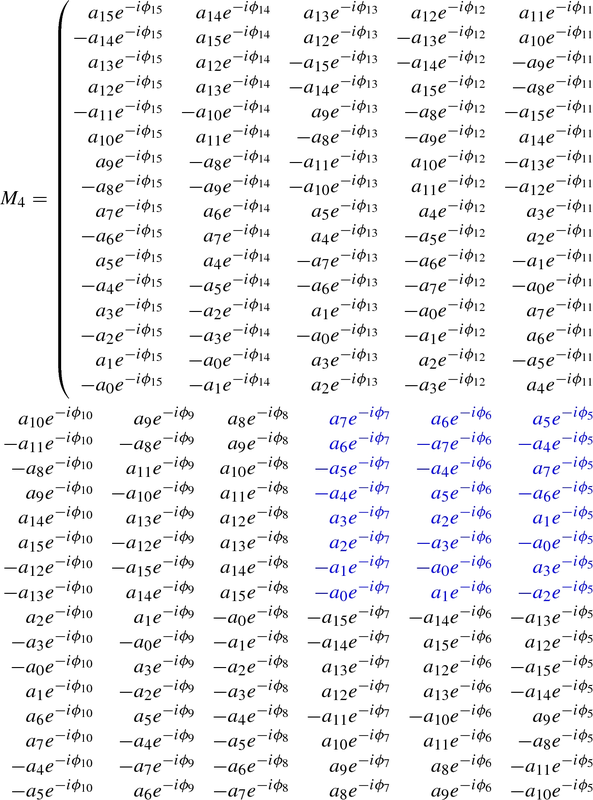 It can be found that the matrix in three-qubit preparation given by Eq. (12) exactly forms the blue elements in the right upper corner in \(M_4\).